About Twice VIP Awards - TWICE holds its annual VIP Awards, giving retailers and distributors the chance to honor products with the potential to make the biggest difference in their businesses. 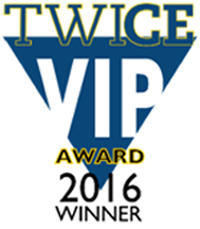 Voted on only by retailers and distributors, the TWICE VIPs are based on product features, product design and value to consumers. The VIP Awards reach more than 150,000 buyers, distributors and independent influencers! About Twice - Established in 1986, TWICE magazine is published twice monthly with an extra issue in January and September. Common topics covered include consumer electronics and major appliance retailing and distribution, custom home installation and networking, home and portable audio and video equipment, digital imaging, portable digital communication devices, small office and home office products and technology, computer technology and accessories.